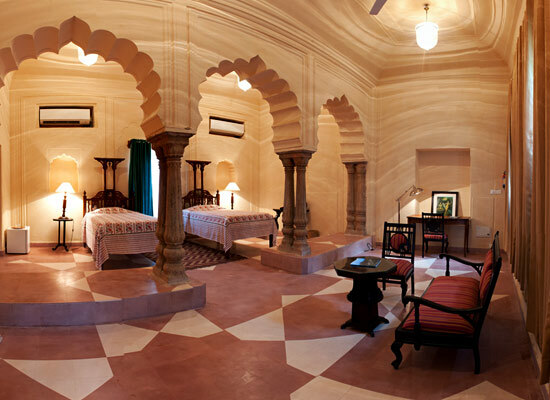 "One of the best heritage hotels in Alwar, Rajasthan, Tijara Fort Palace is a 19th century palace, adorning beautiful art works. 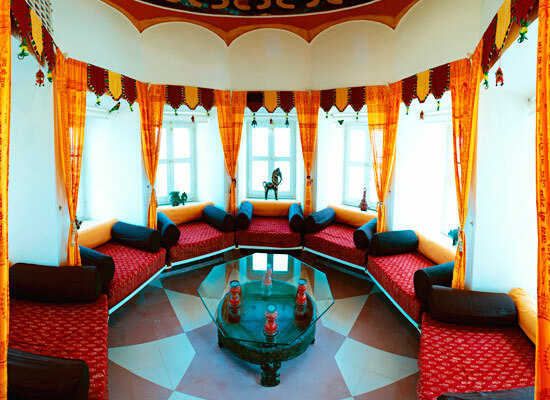 The dining and living areas here have been divided into 3 palace wings and are spread across 8 acres of an area. Compared to the Hanging Gardens of Babylonia, the restored seven-terrace gardens offers lovely views of the surroundings. An ideal weekend getaway from Delhi and Jaipur, it was 21 guest rooms and suites that have a wonderful decor and come with modern comforts. Enjoy memorable heritage experiences here during your stay. Made in the Rajput-Afghan architectural styles, it has early colonial shades like Rani Mahal for the royal ladies, the Mardana portion for the Maharajas, a pleasure palace, Hawa Mahal and more. Constructed in the 19th century, a major part of the Tijara fort-palace complex was opened for public turning it into one of the heritage hotels of Alwar in the winters of 2015. 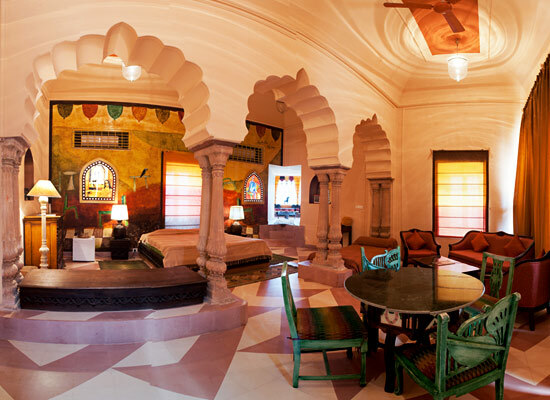 Tijara fort of Alwar has spacious and well-adorned 21 rooms and suites that have been named after the popular leading lady painters of India. Spread across 8 acres, in three palace wings, the accommodation is spread from ground floor to third floor. The living spaces are attached to the dining area through hanging gardens. The accommodation here has been classified Pent House Suite (1), Turret Suites (11), Suites (4), Grand Rooms (3), and Rooms (2) that can easily accommodate 57 guests at one time. Two or more adjacent rooms, can easily be made available. 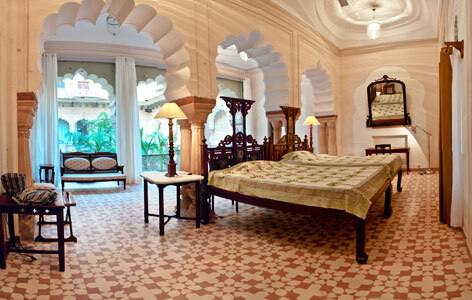 Out of the 21 rooms, the names of some of the rooms are Anju Mahal, Bharti Mahal, Jaya Mahal, Arpana Mahal, Mardana (1-8), Amrita-Vivan Mahal, Anjolie Mahal and so on. The decor of all the rooms is wonderful and warm. The furniture is antique and the interiors are regal. Air-conditioner, four poster bed, choice of king-size bed, twin-bed, queen-size bed, separate sitting and sleeping area, sofas with center table, chairs with coffee table, mini refrigerators are some of the facilities offered in the rooms. The attached bathrooms are clean and huge and come with plush toiletries. Connected to the living areas through hanging gardens, Tijara fort has a huge dining areas where the guests can savor sumptuous delicacies of Indian and popular international cuisines. Rajasthani fare is the specialty. However, there are no bar facilities. Meals can also be arranged at special location, on prior request. 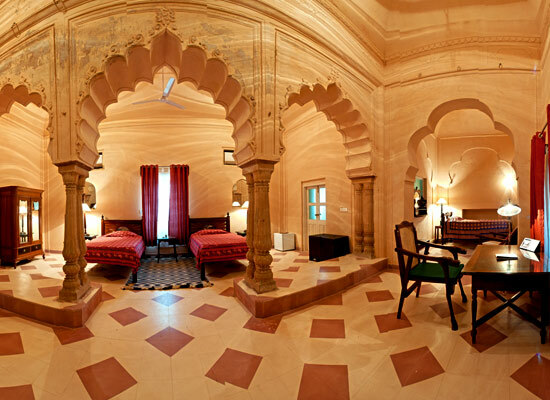 Located in the royal state of Rajasthan, Alwar boasts of a rich Rajput history that can be traced back to 1500 BC. Just 160 km from Delhi, it is quite popular for its proximity to the well-known Sariska Tiger Reserve. Formerly known as Mewat, it is dotted with various attractions like Siliserh Lake, Bhangarh fort, Bala Qila, Vijay Mandir Mahal, Company Bagh, Government Museum, Karni Mata temple, Jagannath temple etc.